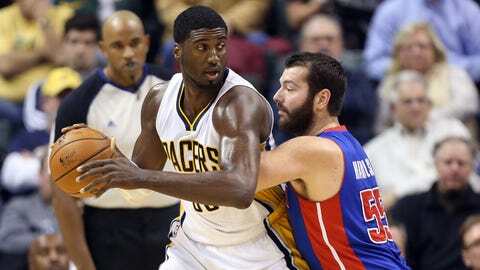 Detroit held Roy Hibbert to six points and four rebounds. INDIANAPOLIS (AP) Detroit threw a surprise road block in Indiana’s path to the Eastern Conference’s top seed. Now the Pacers face another daunting task — winning at Miami to avoid their first losing streak of the season. Josh Smith scored 30 points, Brandon Jennings added 18 and Greg Monroe finished with 13 points and 12 rebounds to help the Pistons stun Indiana 101-96 Monday night and hand the Pacers their first home defeat this season. "We’re going to have a target on our back all year," Pacers guard George Hill said. "We’ve had some success so far, so we’re taking everyone’s best shot and today we didn’t come to play." It was evident right from the start that this was not the same Indiana team that set a franchise record by starting 9-0 overall and another by opening the season 11-0 at home. Some wondered before the game whether the Pacers (20-4) might get caught looking past the Pistons (12-14), who have won two of their last six, and ahead to Wednesday night’s marquee rematch with Miami. Indiana defeated the two-time defending champs 99-94 in Indy last week and heads to South Beach for the first time since losing Game 7 of the conference finals in June. Coach Frank Vogel downplayed the notion Indiana was distracted, saying before and after the game that his team was not "looking ahead at all." The Pistons were tougher inside, tougher on defense and tougher at fending off challenges. And the Eastern Conference’s top team looked like anything but as Detroit played almost flawlessly and beat Indiana at its own game by dominating the middle. "It’s impressive the way we came in and competed with the way the Pacers have been playing," Pistons coach Maurice Cheeks said. "We have a good basketball team." The Pistons held a 55-40 rebounding advantage and a lopsided 20-9 edge on offensive rebounds, something Paul George contended threw the Pacers off. Detroit also outscored Indiana 44-38 in the paint and 22-14 on second-chance points while shooting 43.2 percent from the field, the same as Indiana. For a Pacers team that prides itself on defense and rebounding, it wasn’t even close to their best as they tuned up for Miami. Indiana never tied the score in the second half and never took the lead on its home floor, falling to the second-best record in the league, percentage points behind Portland (21-4). The Pistons knew that to end their six-game losing streak in this series and their nine-game losing streak at Bankers Life Fieldhouse they had to execute the game plan flawlessly. They did. Meanwhile, Miami faced its own unexpected challenge Monday night when struggling Utah played better than advertised in the first half. Unlike the Pacers, though, Miami seized control over the final two quarters and pulled away for a 117-94 win. Paul George was 4 of 14 from the field, finishing with 17 points, nine rebounds and four turnovers. Roy Hibbert had six points and four rebounds. Even the energetic Lance Stephenson couldn’t get his flustered teammates righted. Stephenson scored a career best 23 points and Luis Scola added a season high 18. When asked if he was looking forward to the rematch, George said: "I am. The good thing about the NBA is the quick turnarounds." Detroit used a 10-3 first quarter run to take a 23-14 lead and never trailed thereafter. Even in the second half, when the Pacers typically dominate, the Pistons refused fold. Detroit scored the last eight points of the first half to take a 57-49 lead. Then Smith scored Detroit’s first eight points in the second half, and the surging Pistons took advantage of Indiana’s growing frustration by extending the lead to 72-61 on Brandon Jennings’ layup with 5:20 left in the third quarter. Jennings finished with 18 points and eight assists. "We had a lot of confidence coming in here tonight. We played Portland (Sunday) night in a game we should have won," Jennings said. "Tonight we knew were playing the best team in the Eastern Conference and we were able to give them their first home loss."